Visit our Facebook page or check out the Photos Page for photos. Photos from this year can be seen here. Welcome to the Nelson Farm! For 28 years, thousands of children, parents, grandparents, teachers and students have visited our historic family farm in Litchfield, Minnesota. When the air is crisp and the pumpkins are ripe, plan a weekend visit with your family and friends. Birthday parties and church groups always welcome! All activities are subject to change or cancellation. No outside food allowed on the Farm. 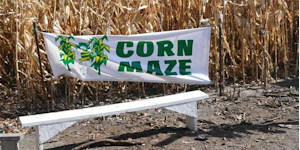 This year's Corn Maze is "Corny Maze"
Learn corn facts. Find clothes pins in the maze and get mini donuts. Group Rates (20 or more) $8.50 per person. Group tickets must be purchased in a single transaction. Reservation required. Birthday Parties $8.50 per person (birthday person FREE) minimum 5 people per birthday person. Reservation required. 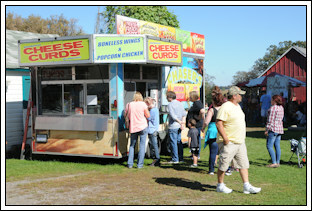 FOOD SHELF WEEKEND $1.00 off admission with a food shelf donation (per person). Check expiration dates. Expired food not accepted. Grandparents bring a grandchild and get $1 off your admission. 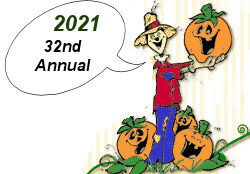 *Purchase pumpkins at the farm. Judging at 3:00 p.m. each day. Oct 29 Farm closed. Thank you for visiting the Nelson Farm. Activities subject to change or cancellation due to weather.